VERIFY: Are kids using marijuana more now that it’s legal in 10 states? We examine kids who use marijuana in states where recreational pot is already legal. Are kids using marijuana more now that it’s legal in 10 states? This claim is too broad. In Colorado, data shows fewer high schoolers using altogether. In Washington, fewer students are trying marijuana, but more are using it regularly since the drug was legalized. 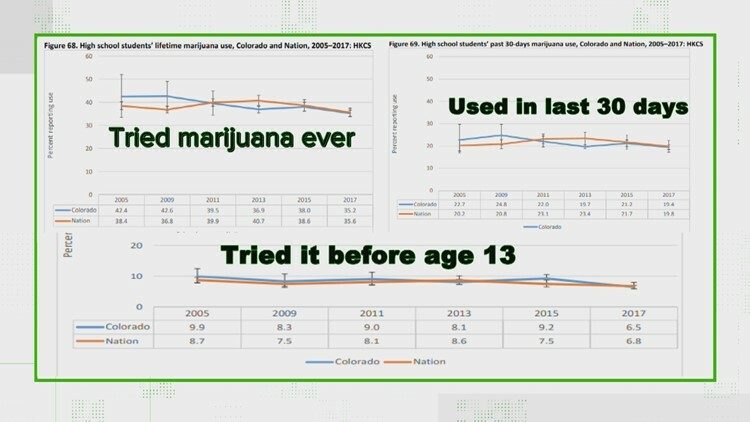 To examine youth marijuana use rates we focused on data from two states that were first to legalize recreational marijuana, Colorado and Washington, that both ended prohibition in 2012. In Colorado the state health department's Healthy Kids Colorado survey includes data from 53,000 school-aged kids. Excerpt from the Healthy Kids Colorado survey. But everyone else appears to be using more as use rates for every single age group over 18 went up. But if we swing over to Washington state there's a different story. Its Healthy Youth Survey includes data from more than 200,000 students. 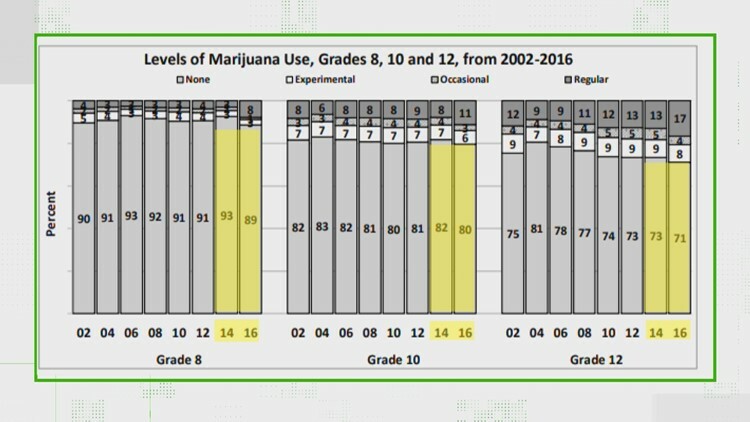 While it shows fewer high schoolers experimenting, and fewer high schoolers using occasionally, it says more kids are using cannabis regularly. The most recent report shows from 2014 to 2016 that 5 percent more 8th graders, 3 percent more 10th graders, and 4 percent more 12th graders said they used marijuana regularly. These are the highest figures recorded since 2002. Washington state's Healthy Youth Survey says more kids are using cannabis regularly. However the perceived harm of marijuana is markedly down in Washington. In 2000, 59 percent of seniors in high school said they perceived marijuana to do great harm to the body with regular use. In 2016 just 24 percent of seniors said the same thing. To submit your own question to get VERIFIED, fill out the form below. On a mobile device click here.